I'm a psychologist by training, a Middle East reporter by experience, an agnostic fascinated by the vast and often terrifying arena in which politics and religion intersect. And as a result, an accidental theologist. Perhaps the thirteen years I lived and worked in Jerusalem have a lot to do with it - a city where politics and religion are at their most incendiary. Or my childhood as the only Jew in a Catholic convent school, which left me with a deep sense of mystery but no affinity for organized religion. Or the fact that I've spent the past fifteen years writing on the roots of conflict in the history of Judaism, Christianity, and Islam. What this means is that my life, like my head, is full of anomalies, a fact that both bemuses and intrigues me. It makes things interesting. Whether as agnostic, as psychologist, or as writer, I'm always asking questions - not to find "answers," but to see where the questions lead. Dead ends sometimes? That's fine. New directions? Interesting. Great insights? Over-ambitious. A glimpse here and there? Perfect. Writer and psychologist Lesley Hazleton was born in England in 1945. Based in Jerusalem 1966-79 and in New York 1979-92, she moved to Seattle in 1992, becoming a United States citizen in 1994. She holds a BA Honors in psychology from England's Manchester University, and an MA in psychology from the Hebrew University of Jerusalem. 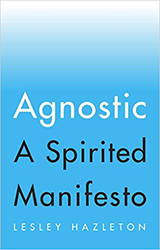 Her BLOG, The Accidental Theologist (www.accidentaltheologist.com), begun in 2010, is "an agnostic eye on religion, politics, and existence." Israeli Women: The Reality Behind the Myths. Simon and Schuster, 1978. (New York Times best-books-of-the-year list). worked as a reporter for Time-Life (Jerusalem bureau). Additionally, her MAGAZINE work has appeared in the following publications, among others: The New York Times Magazine, Harper's, The New Republic, Vanity Fair, The New York Review of Books, Huffington Post, Salon, Time Magazine, The Nation, The Stranger, The New Statesman, The Women's Review of Books, Tikkun. Subjects covered range from politics and religion to psychology, environment, art, and literature. She has given numerous keynote speeches nationwide at conferences; been a guest lecturer at several universities, as well as at mosques, synagogues, and churches; and participated in many panel discussions, both broadcast and live, on politics and religion. National and international television and radio appearances include The Today Show, Good Morning America, Oprah, CNN Headline News, CBS This Morning, Dateline NBC, CNN Presents, and public radio's All Things Considered, On Point, Weekend Edition, and Morning Edition.